Imodium Coupon is a printable coupon. You can visit HealthyEssentials.ca to create your own account, select the coupon and print at home. Make sure before you purchase the item that your store accepted printed coupons as some do not. Most major retail chains accept printed coupons, I’ve been to Walmart and Loblaws and they both accept printed coupons. This is a new Imodium coupon to save $2 on Imodium Liqui-Gels. Imodium Coupon is valid only in Canada. You can find Imodium in drugstores across Canada including Shoppers Drugmart and Rexall. 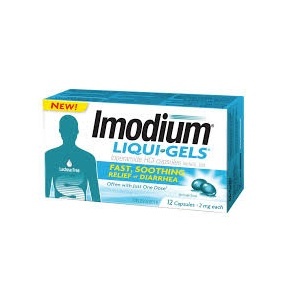 Imodium Liqui-Gels offer fast, soothing relief of diarrhea – usually with just one dose! It will help control symptoms of diarrhea (including traveler’s diarrhea) by restoring balance to your digestive system. The capsules are lactose-free.